Lord Kubera, also known as kuber, kuvera and Dhanpati, is worshipped as the God of wealth by Hindus. He is known as the treasurer of god who showers riches on those who worship him without utmost devotion. 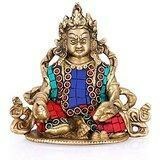 A benevolent, fair-complexioned divine being of short stature and a pot belly is how kubera is usually depicted.Size : 5 Inches Height X 5.5 Inches wide X 8 Inches depth , Weight : 1.4 Kg , Material : Brass, With Turquoise and other coral stone Handwork..-------------- Pls beware from Copy product & ensure buying authentic product. This is exclusive inhouse design & product of Brand "Collectible India" and "covered by intellectual property rights laws". 'Collectible India' doesn t authorize any other Brand/Seller to sell it and we won't be responsible if any counterfeit or substandard product send by any other seller.